When you first join any new GPT site, it can all be a little daunting. If you’ve gotten used to the layout and familiar routine of one site, another one could be totally different and knock you for 6. It might even put you off using the site altogether, but that’s where we, your GPT Genies come in with yet another newbies guide – in this case it’s for relative newcomer Earnably! We’re going to presume you’ve already signed up – that’s the easy part! If not, click on the image above to join, then grab a cup of coffee and let’s get you earning. When you first sign in (on a laptop/desktop) this is what you’re faced with. As you can see, many of the offer walls are ones you’ll already be familiar with from other websites. By clicking on the plus sign bottom right, you’ll see a few extra walls you may not be familiar with but they work in pretty much the same way. Across the top of the front page you should see menu links for Earn, Redeem, Invite and Help, let’s go through some of these before we come back to the walls. So how are you going to make money from each of these options? Those of you who use InstaGC should already be familiar with some of these, and to be honest the best thing you can do if you’re not is click on the links and try out some surveys. We’d recommend starting with YourSurveys as if you’re not suitable for a survey you tend to find out pretty quickly and they’ll reroute you to another one. YourSurveys can be done multiple times a day and pay 75 points a time. Unlike other sites that use YourSurveys (InstaGC for example) there seems to be no time limit between surveys so it’s an easy way to rack up points on your commute, while queuing in shops, watching TV or any other downtime you possibly have. SaySo also ask you to fill in some info, often just your age and a verification task, sometimes more. These surveys are a little more hit and miss than the two already mentioned, and worth varying amounts of points, so if getting disqualified often frustrates the hell out of you, use them as a last resort! So that’s your surveys – if you’re a survey lover (and yes, there are those people out there) then it’s worth having a play and seeing how many points you can get in maybe 20 minutes or so a day, then see if it’s for you. The main three video walls you’ll make money from in the UK are EngagemeTV, S’moresTV and VideoLoyalty – it seems that the rest only have videos for the US, unfortunately. One thing we like about Earnably is that it has a higher rate of payout per credit for EngagemeTV/S’moresTV, at 0.8 points per credit as opposed to 0.7 on InstaGC – it may seem like a small difference but if you can run these videos all day, it can make a difference. Remember, you can’t run EngagemeTv AND SmoresTV at the same time as they are the same company, and you can’t run either of them if you’re already running them for another site. You CAN run either of them and VideoLoyalty at the same time. We find that running EngagemeTV or SmoresTV seems to credit every ten minutes or so on average, sometimes more often, sometimes less. So, if you can find a channel with ads (you won’t get credited if there are no ads as those are what you are actually being paid to watch) then it’s a good passive way to earn points. Remember to check into the GPT Genies Facebook group to find out which channels are crediting for people each day; there’s usually a dedicated thread and a quick search should find it easily. Having problems getting it to credit? The principals are the same whichever site you run EngagemeTV for. The tasks section is run through Figure8, which used to be Crowdflower and can be a good earner if you have the time and can rise up through the ranks. Earnably is quite unique in the GPT world in that their codes queue up, which means you can add multiple codes and they will save, so that once one has ended, the next one will start. They also offer a percentage code rather than a fixed points code, so they can be very lucrative. Offer codes are posted on their Facebook page, Twitter account and of course in the GPT Genies Facebook group thread, and if you’re new to Earnably, start with the code GPTGENIES5 and get an extra 5% on your earnings for 7 days. In addition to this, Earnably run a Trivia Tuesday quiz on Twitter every Tuesday night which can be a lot of fun. You can find out more about it here, and the winners get unique bonus codes just for them! We’d love to see more of you there. And so, back to Offer Walls. These are pretty much the same as most other GPT sites, so it’s pointless to go through them one by one. What we will say is that it’s often worth checking out which site offers more for an offer – often Earnably offers more points than Swagbucks for example for exactly the same offer. Just be aware that it’s often not possible to do the same offer on more than one site, so do your research, especially if it’s a high paying one. Another good thing is that points very rarely pend on Earnably, you usually get your credit the same day, so that’s worth bearing in mind when comparing it to other sites. Take some time and spend a few minutes looking through the offer walls to see what you can find – and of course check out the GPT Genies’ Facebook Group for easy offers that people have posted. But, of course, there’s one more important thing – payment! Earnably offers payment in a number of ways and often cashout is from as little as £1. They offer Paypal and Mastercard, as well as the usual Amazon and Starbucks, alongside Pizza Express, iTunes, Steam and many more. For Paypal and Amazon, the most popular options, at the time of writing £1 was 180 points. As with most sites, it’s often worth saving up for a £5 or £10 voucher / payment, depending on the points value. Prices are listed in UK Pounds, so it’s easy to know how much you’re going to receive. One thing that Earnably do that is different, however, is offer an ‘Autoredeem’ function – this means that they will automatically cash you out when you reach your pre determined level. There is a 1% fee per transaction for this option though. As an example, currently £10 on Paypal is 1410 points. If you had this set to auto redem every £10 you would pay a fee of 14 points each time it did so. Only you can decide whether this is worth it or not, but the auto redeem feature does work well if you want your earnings to be truly passive. Payment takes approximately 3 days to reach you, often quicker depending on how busy they are. As Earnably is a UK based company, you can expect to receive a response during UK office hours and don’t worry about havng to think about US/UK times. 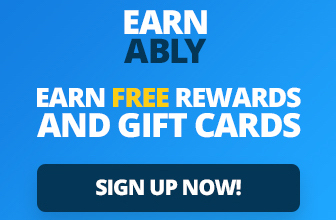 So, as you can see, earning on Earnably is just as easy as on Swagbucks, InstaGC and many other GPT sites, it’s just a case of finding your way around and getting into a routine. You should be able to add it to your GPT list in no time at all. « Say “I Do” to a search win! Check out earnably from your phone too as it has offers that are only available when using your mobile. I’ve made quite a few easy points by downloading and opening apps or playing to a certain level. Beware of cooking craze though. It’s addictive! My top tip is to follow the Earnably on social media as they regularly post point booster codes which can make a real difference. Also like to play TriviaTuesday on Twitter to earn booster codes. Loads of fun and you can learn something new too! That’s a great tip! We love Earnably’s promo codes. I like doing minute staff and check every hour if any new ones. Easy to do and every little helps.